The EKo Pwòp microgrid will provide clean, reliable power to 430 homes and businesses in Southern Haiti. Haiti’s electricity system remains one of the least-effective on the planet, with only 12 per cent of the population officially connected to the grid. This electricity supply is itself intermittent, with frequent service disruptions throughout the day. The figure rises to about 25 per cent once the numerous illegal connections tapping into the system are included. Haiti’s electricity problem is ultimately an energy problem with two facets: production and distribution. Most Haitians, especially in rural areas, cook with wood or charcoal. The Haitian government estimates that about three-quarters of energy used in the country comes from biomass, a factor that continues to exacerbate Haiti’s deforestation problem. The country has around 200 megawatts of installed electric production capacity, but because of lack of maintenance in past decades, most of the country’s major power plants produce at half capacity or less. According to the Ministry of Public Works, Transportation, and Communication, nationwide demand for electricity is 550 megawatts, a fanciful figure given current output. Distribution is another issue altogether, as there’s no national grid. Instead, nine separate electrical networks dot the country. Poor maintenance, lack of funding, and lack of equipment for repairs has caused infrastructure to deteriorate over the years. Old transformers routinely fail. People not connected to the grid tap into it themselves, sapping output. Additionally, EDH doesn’t have the technical systems or management capacity required to bill customers properly, resulting in huge losses each month. These losses have resulted in constant government bailouts which ballooned to around 12 per cent of Haiti’s overall budget in the years following the earthquake. Faced with this frustrating set of facts on the ground, some NGOs such as EarthSpark International have decided to bypass the centralized grid entirely through the construction of smaller microgrids fueled by clean energy. EarthSpark International was founded in 2008, dedicated to ending energy poverty in Haiti. 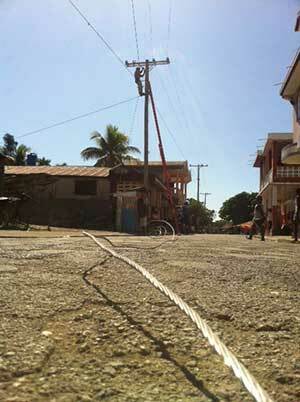 While the company is focused on a range of initiatives, it soon began formulating a plan to construct a microgrid in the downtown portion of Les Anglais in Southern Haiti. After securing initial funding in 2012 from National Geographic and the Government of Norway, EarthSpark began by tapping into excess capacity from a diesel generator powering the local telecommunications tower. This created a base of 54 customers who began transitioning away from the use of expensive kerosene lamps and smaller generators of their own. Further funding from the U.S. Agency for International Development and other partners eventually led to the completion of a state-of-the-art hybrid generation system, which includes a 93-kilowatt solar PV array, 400 kilowatt hours of battery capacity, and a small diesel backup generator. The microgrid, providing power to 430 homes in Los Anglais, was officially unveiled last month in a ribbon-cutting ceremony. To make the grid as accessible as possible, a series of smart meters were installed to shift load limits and maximize grid efficiency. They also allowed EarthSpark to set up a payment system tailored to customers with limited means. “We’re trying to help people consume the electricity they want to consume by selling them electricity credits on a pre-paid basis, rather than sending them a bill at the end of every month and them not necessarily having the money to pay for it,” says EarthSpark co-founder and executive director Dan Schnitzer in an explanatory video for the project. 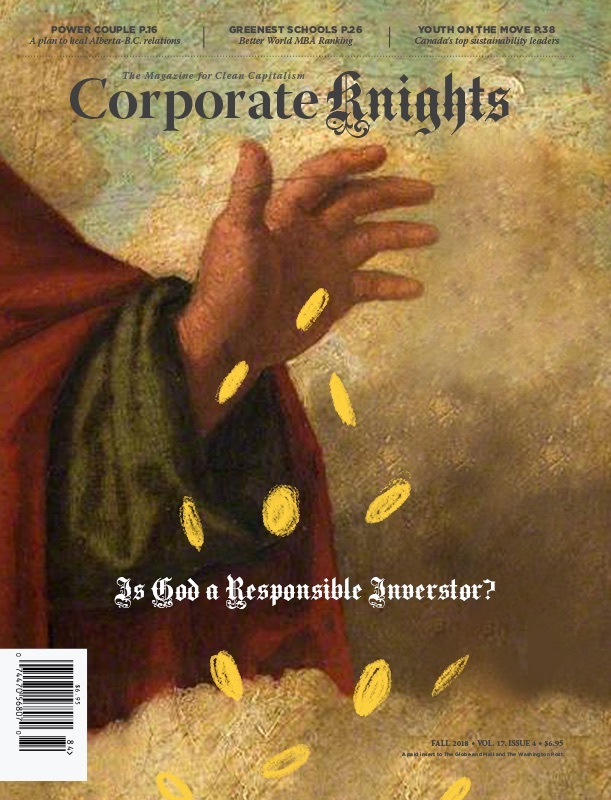 Corporate Knights reported last month on a similar pay-as-you go model employed by Nairobi-based M-KOPA Solar. EarthSpark is hoping its project will serve as a test case for future microgrid expansion across Haiti. At the United Nations Sustainable Energy for All Forum in May, EarthSpark and its Haitian social enterprise spin-off, Enèji Pwòp S.A., announced a commitment to build 80 microgrids in Haiti over the next five years.